Yes folks, it's the once-ubiquitous East German tenor. Built as a stencil horn by the B&S company, these horns were available under a bewildering array of brand names; Weltklang (B&S's own label), B&M Champion (Barnes & Mullins' own label), Trafford, Berg Larsen, Lafleur (who also sourced Czech-built horns)...and probably half a dozen others, including this Elkhart branded example. To prevent confusion I'll refer to this horn as a Weltklang throughout the review. At this point I should make the distinction between this model (produced from around the early 1970s through to the mid '90s) and the earlier models. These were considerably different in both design and construction, and can be considered to be superior instruments in every way. I should also say that if you've come across this review while researching a possible purchase of one of these horns I can save you a great deal of time by advising you to skip the rest of the review...and go buy something else instead. If, however, you're a glutton for punishment - read on, and find out what makes these horns such a risky prospect. During the course of this review I'm going to point out a number of problems with this horn. But here's the thing - they're not unique to this example; they're very much typical of the entire range. When someone calls to say they're bringing a Weltklang in for a service, these issue are almost certainly going to be present - and are going to have to be addressed. You can pick these horns up quite cheaply...but what you save on the purchase price you're likely to lose in the cost of making them work properly. Let's make a start, then, with the design and construction of the body. The toneholes are drawn - but are inline, which means the centre of each hole follows a straight line right down the body. This is something of a throwback given that most horns of this era sported offset toneholes, which means the lower stack hole are shifted slightly round to the right of the upper stack holes. I don't personally have a preference, but some players find offset toneholes provide a better playing position while other still prefer inline (and thus tend to favour vintage horns). The bell is non-detachable and you get a plastic thumb rest and a non-adjustable metal thumb rest. The sling ring is not so much a ring but a piece of square stock brass with a hole drilled in it. It looks a bit clunky, but it does the job. The fun starts with the toneholes. They're almost never level. 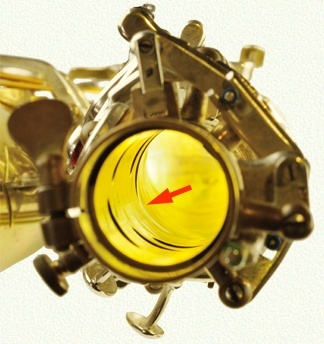 Here's a typical example - it's the low C. I could have picked any other tonehole on this horn...there wasn't a single one that didn't have a warp. This isn't down to collateral damage from a nearby dent, or the result of a bend in the tube (though this horn has a bend, as we'll see later) - it's just the way it's been left when it rolled off the production line. And as far as warps go this one looks quite bad, yet it's not the worst you're likely to find. In fact it's often the case that the warps get proportionally worse as you go up the horn. On this tonehole I guess I'd say that it was 30% compromised. There's a definite dip at front left and there's another, slightly smaller, at rear right. 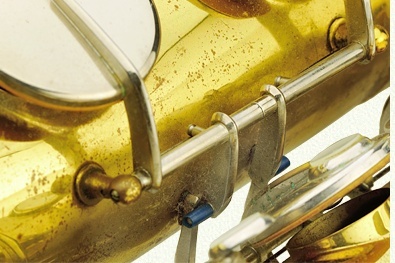 Some of the smaller toneholes regularly reach around the 50% mark - and the further up the horn the leak is, the more it will affect the playability. Make no mistake - this is a major problem. The next big issue is the design of the bell brace. Its shape is very characteristic - unmistakable, even. If you're in any doubt as to whether the Weltklang you're looking at is an early or late model, take a look at the bell brace. It's not the only distinguishing feature, but it's one of the easiest to spot from a distance. What's curious about it (from my perspective) is that it's detachable. I'm a big fan of detachable bell braces, they come in dead handy when you have to remove the bell section. But wait a minute...didn't I just say that the bell wasn't detachable? Yep. You can remove the bell brace with a screwdriver, but you still have to fire up the gas gun to detach the bottom bow joint. I suppose it saves a bit of time. However, you'll quite likely need to unsolder the bell stay mount because it's placed in such a position that a knock to the bell will drive the brace straight into the body - placing a large dent under the stay...and taking out the adjacent toneholes with it (not that they'd have been level in the first place anyway). Note the weird bar to the rear of the bell brace. This is another distinctive trademark of these late model Weltklangs - they have 'detachable' actions. Now, I say detachable because, in theory, you should be able to remove the three or four screws that hold this bar in place and simply lift the stack right off the horn. In practice there's always an obstruction that prevents you from doing so....and you end up having to remove almost as many keys as you would anyway. In other words it's a complete waste of time - at least from a maintenance perspective. As a manufacturing convenience it may well have had more benefits. Here's a shot of the upper stack, in which you can see the bar in more detail. It's quite a departure from the normal methods of construction - in which pillars are either individually fitted to the body (single pillar construction) or fitted in groups to a common base known as a rib or a strap, and then fitted to the body as a single unit (known as ribbed construction). I guess you'd call this 'bar construction'. Note the size of the base on that top lug. It's reassuringly large. This marks this example out as a very late model. Earlier versions sported much smaller bases...and even earlier versions had no base at all, just a lump of hex brass soldered straight onto the body. And this created quite a problem - because one of the joys of owning a Weltklang is the cheerful sound of bits falling off and hitting the floor. 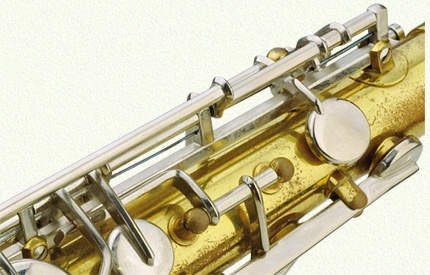 It's often said that cheap saxes will fall apart - and for the most part it's complete rubbish...but when it comes to the Weltklang I'm afraid it's very much par for the course. Some of it's down to the design - but a great deal of it's down to the quality of the solder (it's bloody awful). The real stinger is that while you might readily spot that one of your bell key guard stays has come adrift (again), you might never suss that one of the action bar lugs has come adrift...and you continue to play quite happily, though perhaps wondering why the horn seems to be rather less responsive than it once was. Assuming it ever was, of course. And it's not just the bell key stays and the bar lugs that fall off - take a look at those pillar bases. They're a bit on the mean side - and this, coupled with the dreadful solder, can sometimes mean that they fall off. In some cases you might even be treated to the spectacle of an entire key falling to the ground. This is why it pays to examine the bodywork quite carefully. You'll often see signs of resoldering - and it's a fair bet that not all of it will be entirely neat. It can be a complete pain in the arse to have to completely dismantle half a horn (again) just to refit a poxy stay (again), which is why such repairs are often attempted 'in situ'. This seldom works because you can't clean the old joint properly and you have limited access when it comes to cleaning up the inevitable mess. This also explains why you're quite likely to see that parts have been refitted with a drop of glue. This can actually be quite an effective repair in some circumstances - and certainly no less likely to fail than the original joint. I notice I've drifted into discussing the keywork - and it's here where, perhaps, the horn gets its reputation of being 'built like a tank'. There's no doubt about it, the keywork is as tough as old boots. Whatever problems the Weltklang has (and it has many), bendy keys isn't one of them. Unfortunately, strong keywork doesn't really add anything to the overall robustness of the horn if the underlying structure is weak (which it is). A more accurate statement would be 'it looks like a tank', and the relative crudity of the keywork's designs bears this out. Have a look at the bell key table. No frills here. To be fair it's not that bad a design - it certainly not what you'd call slick, but it's at least quite functional. A despite looking like someone's cut the touchpieces out of a lump of brass with a pair of scissors, it's by no means the worst bell key table out there. Note the square sling ring beneath the horn. Things aren't much better at the other end of the bell keys. 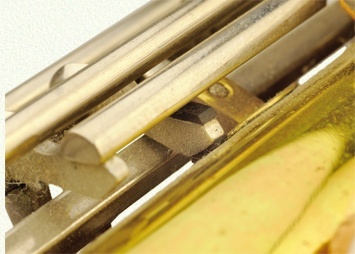 They've gone for a two-piece design, which necessitates the use of sliding connectors between the lever keys and a cup keys. This always gives the action a very approximate, clunky feel which translates into a bit of sponginess at the table keys. It's also something of a puzzle that they've opted for a levered design for the low B and Bb, but fitted a single-piece low C# key. Should've been the other way round, really. On the plus side they've stuck with simple fork and pin connectors for the side Bb/C keys - and while the octave mech is a bit on the clunky side it's nonetheless quite robust, and at least features a profiled touchpiece. Another plus is that they've used proper point screws throughout - which is handy if the action ever needs tightening up - and a non-ferrous (i.e. not steel) alloy for the rod screws. This is a very useful feature for a horn aimed at the student market, because it means the rods won't rust due to a lack of oil. It sounds like the sort of thing all the manufacturers should be using, but as with most things there are pros and cons. Wear is one of them - and although the alloy won't rust it can still corrode over time (though nowhere near as quickly as steel will rust). It's also a great deal easier to break a screw slot if you're at all heavy-handed with a screwdriver - and this is another 'feature' you need to be aware of when examining a potential purchase. So we have a few problems with the body coupled with a slightly agricultural action - but here's where things get really, really bad. It's the corks and the pads. 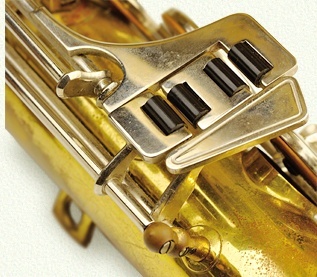 The use of the unusual bar construction and the detachable bell brace suggest that some thought has gone into making this horn quick and easy to manufacture - and they've extended this philosophy to the key corks. They're not corks at all - they're bits of rubber. Bits of squishy rubber at that. If you consider that the job of these corks is to prevent metal-to-metal contact while being neither too hard to be noisy nor too soft to maintain consistency - they're almost a complete failure. This model sports black rubber 'corks', but earlier versions used red rubber ones...and even earlier models simply used a piece of rubber tubing that fitted over the key feet like a lumpy old sock. They certainly work as a means of preventing metal-to-metal contact, but that's really the best that can be said for them. As regulation corks they're particularly useless, being far too squidgy to maintain a consistent tolerance - and they also tend to break down and degrade over time, which makes them rather sticky. And then they either fall apart or fall off. They shouldn't really work at all, but they do so because of the other 'killer' feature...the pads. Oh my, the East German pads. These things are legendary amongst repairers. They're arguably as legendary as the renowned Gordon Beeson pads - the difference being that one is revered and one is reviled. Can you guess which is which? Let me put you out of your misery. Here are a couple of Weltklang pads. There's actually something of a mystery about these pads - no-one seems to know for sure what the 'leather' is made of. It sort of looks like leather, and it sort of feels like leather, but it isn't leather. Or if it is, they've done something terrible to it. It's undeniably tough stuff, I'll give it that - but it has a very fibrous consistency. It puts me in mind of the sort of material you'd get if you gave someone an old shoe and a sheet of asbestos, and told them to chew on it for a couple of years before spitting it out. Does anyone know for sure what this stuff is? Anyone? At all?? The next point of interest is the internal ring. Now this isn't a new idea - it was a device much favoured by Conn in their 'Resopads'. In technical terms it's rather a neat idea. One of the problems with a standard pad is that it's almost impossible to make it flat. 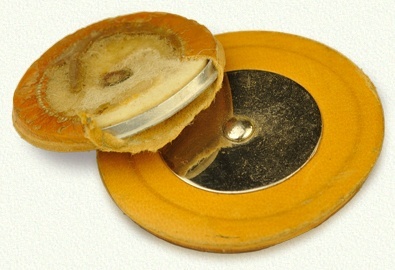 The felt core, by its very nature, is flexible - and where the leather is stretched over the pad it tends to pull the edges of the felt core downwards. This results in a edge that rolls off - and in practical terms that means there's less properly flat surface area on the pad. It's no big deal as rule - but as the size of the pad approaches the size of the tonehole it has to cover, the rolloff can become quite critical. Think in terms of trying to put your thumb over a hosepipe under pressure. You can cover a small hose with ease - no water will escape - but as the hose gets larger it becomes increasingly difficult to maintain a reliable seal. Water starts spurting out from the rolloff on the side of your thumb...and you get wet. So the metal ring serves as a sort of brace, allowing the leather to be stretched over it rather than the felt core. It also increases the working diameter of the pad. A normal pad fits right inside a key cup, but a 'Resopad' sits on top of the rim of the cup...so you get around an extra millimetre or so on the working diameter. It's a neat idea - but, as usual, there are pros and cons...and one of the biggest cons is that the exposed edge of the pad tends to get scuffed in use, and the metal ring exacerbates this problem. The leather wears, it breaks, then splits and then tears. Or rather it would if it were proper leather. The Weltklang stuff just sits there, shrugging off just about anything you can throw at it. It doesn't even burn, fergawdssake. And then we come to the felt core. Now, I say felt - but, again, I'm not entirely sure what this stuff is. Remember the poor soul who's busily chewing away on the old shoe and asbestos? There's another one chewing on an old tea towel and a ball of string. Whatever this stuff is, it's as soft as...well, you know the score. And then there's backing, or rather the complete lack of it. A pad needs a backing, to help firm it up and to prevent shellac/glue from contaminating the felt. Without it you'd have to rely on there being sufficient glue in the key cup and complete coverage of the pad base...and that ain't gonna happen when all you're using to stick them in with is a dollop of industrial-strength Evo-Stik. It all adds up to a pad that, on the one hand, is as hardwearing as a nuclear fallout shelter and on the other is as firm as lump of ripe Brie. But this is both a blessing and a curse when it comes to the Weltklang, because while it's bloody awful it's exactly what you need if you're going to fit it to a horn with wobbly toneholes and regulation corks made out of old tyres. If you're lucky enough to have level toneholes, and some kindly soul has replaced all the rubber with nice bits of proper cork, there's a good chance that these pads will outlive you....as long as you don't mind a rather vague feel to the action and a couple of leaks here and there. Don't even think about having the pads reset...it's simply not going to happen. So now we have to put all this together and come up with an impression as to how the horn feels and plays. Well, it feels bloody awful. No, really, it does. There's no poise, no grace, no finesse about these things. If you're an 800 pound gorilla it'll be fine - but anyone else will stumble over the 'ergonomics' and fall foul of the combined effects of the crappy pads and bouncy key corks. The plastic key pearls aren't much fun either. The situation isn't helped by the rather old-fashioned design of the keywork, what with the quaint levers on the bell keys and some of the slightly bizarre positioning (did you clock the position of the front top F touchpiece in the opening shot?). You also have to contend with all the top stack keys being mounted on a single rod - which is a design that's particularly prone to flexing. This example was fitted with blued steel springs (not bad), but earlier ones used a strange kind of soft black steel springs. They weren't great...but they didn't often break, I'll give them that much. And as for the playability. I know I'm going to ruffle quite a few feathers here - but I believe this has to be said. They're mediocre blowers. I've heard it said that Weltklangs have quite a vintage tone. I guess that's because they're not what you'd call a bright horn. But here's the thing - the absence of a bright, clear, freeblowing tone is not the same as a vintage one. A vintage tone is a complex thing, made up from a finely-balanced harmonic structure. Its depth is tempered by the sheen of subtle brilliance, its midrange imbued with both power and expression. That, my friends, is a vintage tone - and that, my friends, is precisely what the Weltklang doesn't have. Sure, it can honk out a line - it's brash, it's graunchy, but it's almost entirely two-dimensional. I have a feeling that most of what people mistake for a vintage tone is down to the fact that the vast, vast majority of these horns are leaking like a sieve that's seen better days. I've played them at their worst, and I've played them at their best - and they're comprehensively outclassed in every department by just about any other horn out there. If you're still not convinced, there's yet one more monster hiding under the bed. It's the smell. Yup, that's right - the smell. It's yet another one of those inexplicable Weltklang mysteries. These horns - how shall I put this - ripen with age. Don't get me wrong, I quite like the musty aroma of a fine vintage horn (I'm funny that way). The piquancy of tarnishing silver, the musk of old brass, the leafy notes of fading leather....ahh, 'tis a simple pleasure. You get nothing like that from a stinky ol' Weltklang - it's more of the tramp than the truffle. And there's no getting rid of it either. You can soak the damn things in Febreeze for all the good it will do - the niff will always return. Nobody knows what causes it. Is it the strange faux leather? Is it the tenacious glue that sticks the pads in place? Could it even be some kind of bizarre lubricant? The worst of it is that if you turn up on stage with one of these things, your fellow musicians won't think it's your horn that's responsible for the pong - they'll think it's you....and you'll forever after be known as 'that stinky dude with the weird horn'. It might well be something to do with the case. It's a very simple box affair with a typically Eastern Bloc approach to padding. In other words it has virtually none at all. If you buy a Weltklang the very next thing you'll need to buy (after a clothes peg for your nose) is a decent case. These horns are fragile enough as it is, but rattling about in what's little more than a badly fitted wooden box isn't going to do the horn any favours at all. In fact that's exactly what had happened to this particular horn - a classic example of 'case shock', whereby the case takes a whack and the resulting shock gets transmitted down the horn's bell brace and straight into the body...which promptly bends. Removing such bends is tricky enough on any horn, but on a Weltklang you have the added problem of various bits falling off during the straightening process. It's not much fun, hence it tends not to be cheap. The best that can be said of the case is that it has catches fitted rather than zips -which is always a plus in my books. It's my very sincere hope that this review will dissuade many of you from investing your hard-earned cash on one of these old boilers. Over the years I've worked on hundreds of these horns simply because they were once the staple fare of any school that had a music department. In time they were replaced with far better horns from the likes of Jupiter et al - but they still keep turning up on the workbench. Some of this, undoubtedly, will be down to first-time buyers who don't know any better - but a fair number of them are bought by people who really ought to know better, but who are fooled by positive comments on various forums...probably by people who're trying to sell them. "Vintage tone!" "Tough as old boots!" "Great fun!" "Cheap and cheerful!". Some are fooled by the fact that the baritone version is actually quite playable - but that's the thing with instruments...the deeper they go, the more you can get away with. If you think the tenor's bad you should try a Weltklang alto - or, if you're bonkers enough, a soprano. I get that these things can be picked up quite cheaply, but you have to be realistic about what you're likely to get for your money. If you just want a horn there are lots of used Taiwanese models out there, as well as any number of Chinese horns. You'll still be taking a chance but you'd really have to go some to be worse off than buying a Weltklang. And if you're after something with a more vintage air, there are plenty of old USA stencil and less well-known European horns out there that routinely sell at budget prices. But if you're dead set on buying a Weltklang I'd strongly recommend doing some in-depth research as to which models to go for (now that you know which ones to avoid). 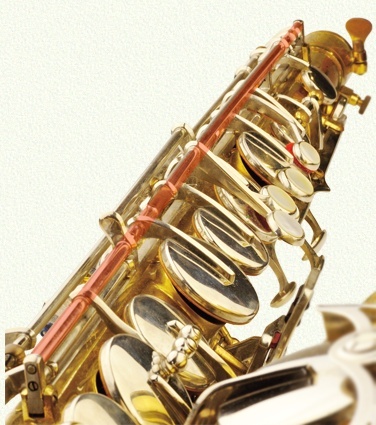 A good starting point would be the excellent article on the Bassic Sax blog.